A birth is a time for celebration. Whether it is a friend or a relative, their lives will soon have forever been changed by a cherubic angel! Having a baby and raising it are two of the most rewarding experiences that a parent can have. Therefore, it would come as no surprise that the parent(s) are ecstatic about the birth. A baby shower would seem about right at this juncture. Of course, you are going to attend it. But have you given any thought to the present? Nothing says how happy you are like the perfect gift because it says all that and more. Instead of only buying something for the baby, we’d suggest getting the item personalized. Think about it, the baby’s name on one of the first gifts they’d ever receive. Doesn’t that sound just heavenly? Maybe though, you won’t just be attending the baby shower. Depending on your relationship to the baby about to be born and its parents, may be more participation on your behalf could be required. 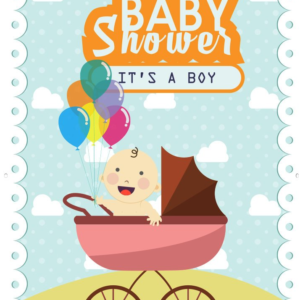 The parents-to-be will love you forever if you intend to throw a baby shower for them. Now, planning a baby shower and pulling it off successfully can be hard, stressful work. We know you’d want everything to be flawless, whether it is the flavor of the cake or party favors. So, we’d recommend that you log on to our website and shop at Personalized By Kate for everything you’d need. The first thing you’d need are invites that make everyone who receives them squeal with delight. Everyone who intends who join the celebration would get a happy reminder when you send those out. Get those from Personalized By Kate right away. For instance, you could choose from our stock, select items that you can hand guests as party favors. Engraved items that sport the name of the new addition to the family sound like a good idea. When the guests leave with your carefully selected favors, they are bound to remember the occasion for a long time. Similarly, no baby shower would be complete without an amazing cake. Yes, the flavor and the shape of the cake are important because it can’t be anything but perfect. However, that isn’t all. A cake would simply look less fabulous if it doesn’t have a cake topper that screams out the good news to the world. 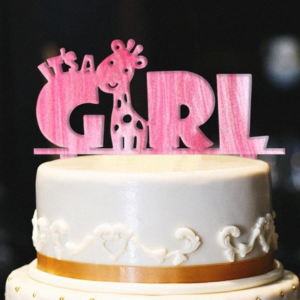 Our cake toppers can make all that happen! So, order one from Personalized By Kate promptly. Where there is a cake or a party, there should also be drinks! Personalized By Kate also stocks sundry items, such as glasses and paper plates, and spoons that every baby shower needs. Just order everything and leave us to take care of it. After all, there are much more important things that await your attention. Why spend time worrying about plates and glasses? No matter what you need for the baby shower you are attending or throwing to be a success, Personalized By Kate has it.